WASHINGTON -- President Donald Trump and Senate Majority Leader Mitch McConnell pledged Monday to work together on the GOP goal if overhauling federal taxes, proclaiming that despite reports to the contrary their relationship is just fine. 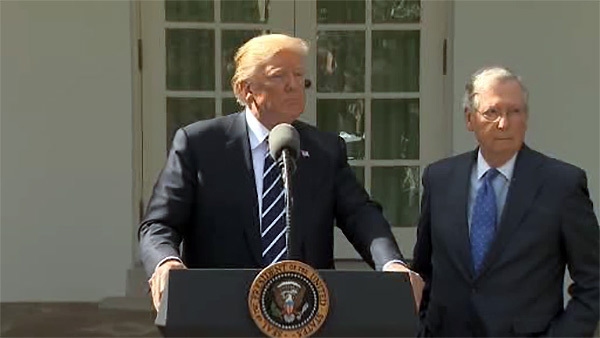 "We're probably now closer than ever before," Trump said alongside McConnell in a hastily scheduled joint news conference in the White House Rose Garden. "My relationship with this gentleman is outstanding," added Trump, who spent August attacking McConnell for failing to pass legislation to repeal the Affordable Care Act, calling the failure "a disgrace." McConnell, R-Ky., seconded the president's latest views. "Contrary to what some of you may have reported, we are together, totally, on this agenda to move America forward," said McConnell, who had complained over the summer that Trump had "excessive expectations" for how quickly Congress could act. The two took questions at length from a quickly assembled White House press corps that stood bunched together on the lawn since there wasn't even time to set up chairs. Trump defended his former top adviser, Steve Bannon, who is now threatening all-out political war on McConnell and establishment Republicans, including incumbent senators. But the president also suggested he might try to talk Bannon out of some of his threats against Senate Republicans whom McConnell pledged to defend. "Just so you understand, the Republican Party is very, very unified," Trump insisted. It was not clear what led to the impromptu question-and-answer session, which followed lunch between the two men at the White House. It comes at a critical time, with the Senate poised to take a crucial vote this week on a budget that would set the stage for tax legislation that many Republicans view as make-or-break following the failure on health care. The last time McConnell was at the White House was early last month. On that occasion, Trump bypassed McConnell and Republican House Speaker Paul Ryan to cut a deal with the Senate's Democratic leader, Chuck Schumer, and House Minority Leader Nancy Pelosi on debt and spending. Trump also denounced the investigation into his campaign's involvement with Russia, being conducted by a special counsel and GOP-led congressional committees. "The whole Russia thing was an excuse for the Democrats losing an election," Trump said. "There has been absolutely no collusion ... they ought to get to the end of it" because people are sick of it, Trump said. The president also got a question about Hillary Clinton and the NFL and took the occasion to implore her to run again in 2020.